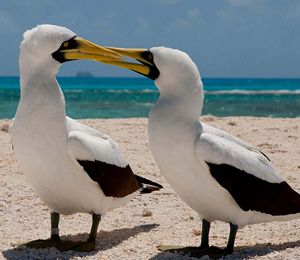 The Masked Booby is one of the many species of birds that you will find out in the Dry Tortugas. Measuring between 81 and 91 centimeters in length, these are one of the larger species of seabirds that are found out on the Dry Tortugas. While you can sometimes see them on land at the Dry Tortugas, you are more likely to find it out in the waters of the Gulf of Mexico. The Masked Booby is distinguishable through the dark grey, almost black, on its face, covering its eyes and the outline of its beak. The adult masked booby is white and has pointed black wings as well as a pointed black tail. The only distinguishing feature between the male and the female masked booby is the color of the bill: the male's is yellow and the female's is of a greenish tint. These birds do not make much noise when out at sea, but when they gather in their nesting colonies, they have a distinct reedy whistling greeting call. Masked Boobies feed on small fish and species of flying fish. They don't move much but when it comes time to feed, they are quite impressive divers and plunge into the sea diagonally at quite high speeds. They lay two eggs during breeding and nesting season, but only one of them is actually raised by the parent birds. The first baby masked booby to hatch typically throws the other egg off the nest, leaving the other baby to fend for itself, usually leaving it up for scavengers such as crabs and land birds. These birds not too easy to find so consider yourself lucky if you are able to spot these interesting birds.